Many decidability results are known for non-recursive cryptographic protocols, where the protocol steps can be expressed by simple rewriting rules. Recently, a tree transducer-based model was proposed for recursive protocols, where the protocol steps involve some kind of recursive computations. This model has, however, some limitations: (1) rules are assumed to have linear left-hand sides (so no equality tests can be performed), (2) only finite amount of information can be conveyed from one receive-send action to the next ones. It has been proven that, in this model, relaxing these assumptions leads to undecidability. 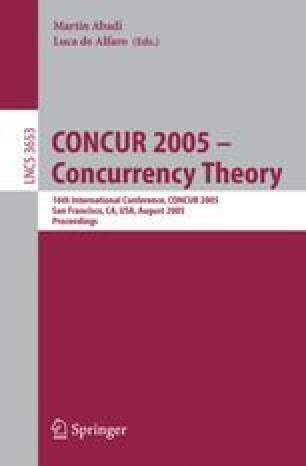 In this paper, we propose a formalism, called selecting theories, which extends the standard non-recursive term rewriting model and allows participants to compare and store arbitrary messages. This formalism can model recursive protocols, where participants, in each protocol step, are able to send a number of messages unbounded w.r.t. the size of the protocol. We prove that insecurity of protocols with selecting theories is decidable in nexptime. Partially supported by the RNTL project PROUVE-03V360 and by SATIN Project of ACI Sécurité Informatique.